The media is replete with stories of young children, no, babies- being killed by men they trusted; men who should be protecting them, prompting the well known Nigerian senator Florence Ita -Giwa to advocate the dismemberment (cutting off the penises) of men who committed such heinous sexual crimes against children! Pray, What manner of sickness would make a man unleash such unimaginable horror and pain on a defenseless child? Should the perpetrator of such a crime and the child’s custodian who exposes the child to such danger be punished alike? A 10-month-old baby girl has died after allegedly being raped and beaten by her mother’s boyfriend, according to reports. 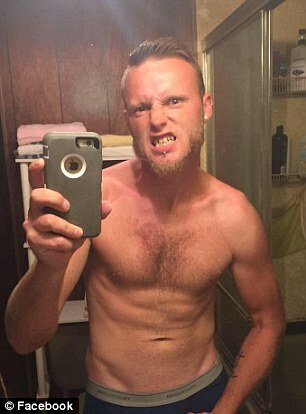 Benjamin (‘Benji’) Ryan Taylor, 32, of Cottageville, West Virginia, was arrested and charged on Monday in the sexual assault and death of 10-month-old Emmaleigh, according to the West Virginia Gazette. 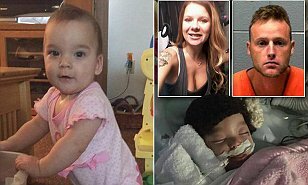 The girl’s mother, Amanda Leigh Adkins, who has four children, reportedly woke up between 4.30am and 5am and found her baby girl naked and bleeding on her basement floor. Police said that when they arrived at the house in Meadowlark Lane in Ripley, they found Taylor trying to ‘wipe something’ off his groin area, which police later determined to be the baby’s blood, according to WSAZ. Blankets and clothes covered with blood were near where they said Taylor had been with the baby in the basement. Adkins was holding the baby and had blood on her. She told them she’d found the baby naked on the basement floor. Police said Taylor originally told them he did not know how the baby was injured, but later said he ‘blacked out’ while doing laundry with the baby. Taylor is not the girl’s father. Even the most hardened police were horrified by what they found in the house. ‘I’ve not encountered anything of this nature as long as I’ve been here,’ Jackson County Sheriff Tony Boggs said. Emmaleigh later died in the intensive care unit of Charleston Area Medical Center. Three other children were in the house at the time, according to police. Rick Grunes, who appears to be Emmaleigh’s grandfather, shared the Go Fund Me link on Facebook on Thursday and wrote: ‘At this time, we regret to say that the injuries sustained from the attack on our child, Emmaleigh Elizabeth Barringer, have resulted in her death.